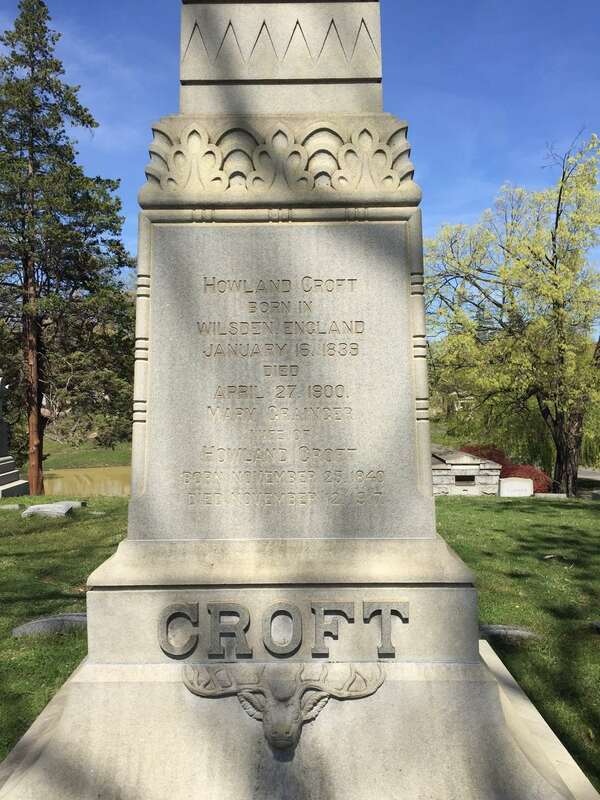 HOWLAND CROFT was born January 16, 1839, at Wilsden, in Yorkshire, England, the son of John and Ann Howland Croft. His brother, John Croft Jr., had joined the Church of Latter Day Saints while in England, and had come to America in 1860, settling in Utah, while his sister Margaret and her husband had settled in Camden NJ. 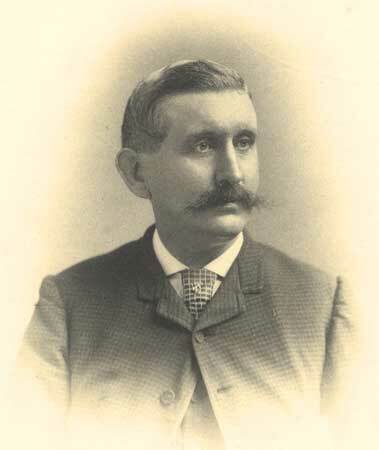 On October 16, 1867 Howland Croft left England with his family and sailed to Philadelphia PA on the ship “City of Paris.” After working in mills in Philadelphia, he went into business for himself with a few partners. 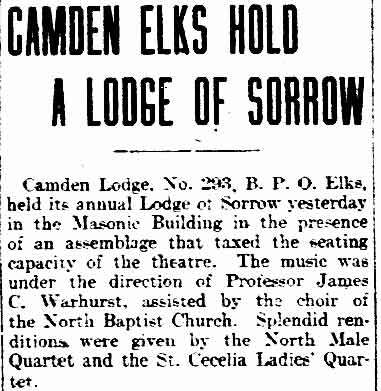 In 1884 he partnered with Herbert Priestly, whom he had known as a young man in England, and in 1885 the two founded and operated a worsted mill which operated until the early 1950s on Broadway between Winslow Street and Jefferson Street in Camden NJ. Howland Croft passed away in Camden NJ on April 27, 1900 from diabetes, and was buried at Harleigh Cemetery in Camden. The Howland Croft, Sons & Company mill was destroyed by fire on June 10, 2011. HOWLAND CROFT, the active head and senior proprietor of the industry just described, was born January 16, 1839, at Wilsden, in Yorkshire, England, and is a son of John and Hannah Howland Croft. His father was a coachman for Major Benjamin Farrand, a large land-owner of that country. His mother is of Scotch descent, as the name indicates. Young Croft became an orphan at the early age of three years, when his father was fatally injured by being thrown from a horse, and the boy was placed upon his own resources to gain a livelihood. As soon as he was large enough to perform manual labor he was employed in a worsted-mill in his native place, spending one-half the day in school and the other half in the mill, until he arrived at the age of twelve years, when he devoted full time to his work in the mill, and continued thus employed until he was seventeen. Being an active boy and quick to learn the business, he then went to the town of Farsley, in Yorkshire, and took charge of a small factory, and while there met Mr. Briggs Priestly, father of his present partner, now a member of the English Parliament, and a large manufacturer and land-owner of Bradford, England. Mr. Croft remained in that position until 1867; in the meantime the mill was enlarged. During that year he concluded to come to America. He located in Philadelphia, and immediately thereafter became superintendent of one of the departments of the worsted-mill of John and William Yewdell, then the only manufactory of its kind in that city. After and engagement of three weeks he was sent by his employers to England to purchase improved machinery for their enlarged mill, and upon his return he brought his family with him. 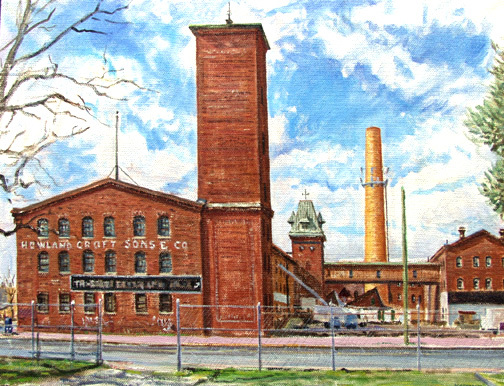 After an engagement of two years in the employ mentioned, Mr. Croft was solicited by George Campbell to superintend the establishment and management of a new worsted-mill at Twenty-first Street and Washington Avenue, Philadelphia, which soon developed to be the largest worsted manufactory in the city. 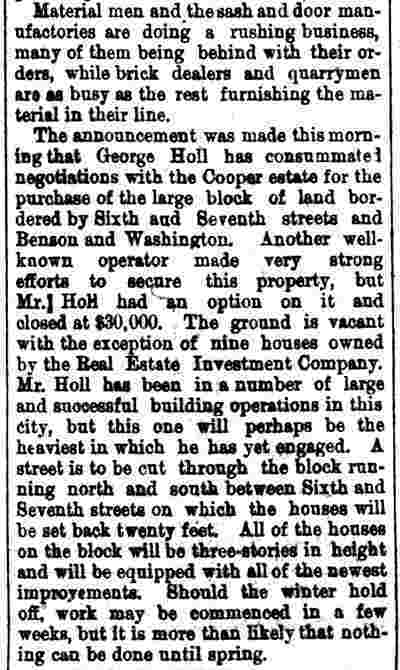 He continued in that responsible position and built up the interests of his employer until 1879, when he retired from the position, went to England to purchase machinery for a new worsted-mill to be located at Front Street and Linden, in Camden, and of which, upon returning, he became the senior proprietor, under the firm name of Croft, Midgely & Rommel, who operated the first worsted-mill in New Jersey. This partnership existed for two and a half years. 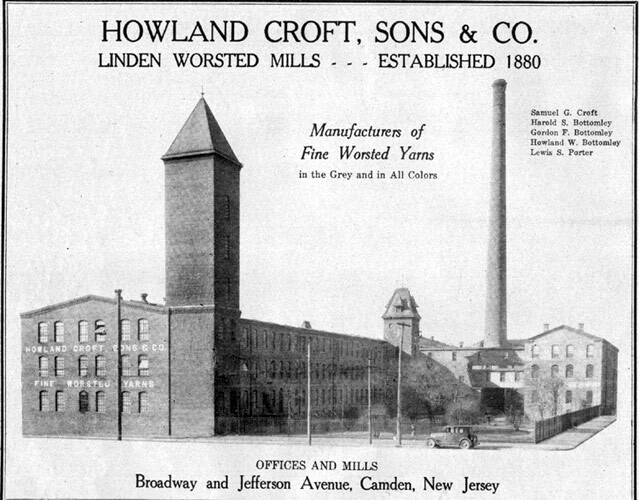 In 1884 Mr. Croft purchased the interest of his partners and called in as his new partner, Mr. Herbert Priestly, and formed the present firm of Croft & Priestly, and they also operated a mill in Philadelphia, along with the Camden mill. 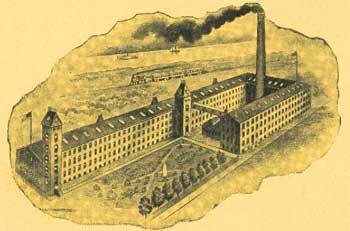 In 1885 the firm of Croft & Priestly disposed of their other mills and purchased the one which they now own and operate. Mr. Croft was married, in 1859, in Farsley, England, to Mary Granger, daughter of William Granger, of that town. By this marriage were born eight children, six of whom -- Annie, John William, Miranda, Clara, George and Samuel -- are now living. John William, the eldest son, is engaged with his father in business. The two youngest sons are attending school near Harrowgate, in England. Howland Croft was close to his older brother John throughout his life. Howland Croft and his family journeyed to Colorado to visit his brother in 1882, and the two brothers took a trip together to England and France, and visited relatives and their childhood haunts in Yorkshire. The brothers partnered in several business ventures as well, including a boarding house at the mines near Como Springs, Colorado, in the spring of 1880 and at Franceville about the same time, and in 1890, an 80-acre farm south of Farmington near the shore of the Salt Lake. They thought they had a promising oil site, but it didn't turn out for them. 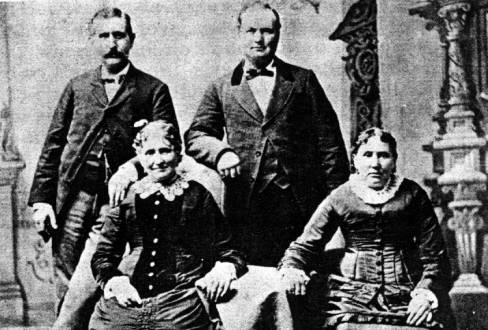 Howland and Mary Croft had eight children: Ann born 14 March 1860 Farsley, Yorkshire, England; John William born 16 May 1862 Farsley; Miranda born 14 August 1864 Farlsey; Clara born 14 Feb 1867 Farsley; Thomas Howland born on 31 August 1869 Philadelphia PA but who died on July 31, 1871 and was buried at Mount Moriah Cemetery in Philadelphia; George Howland, born 24 Oct 1871 Philadelphia; Samuel Grainger born 2 March 1874; and Letitia Margaret born 19 August 1876 Philadelphia. 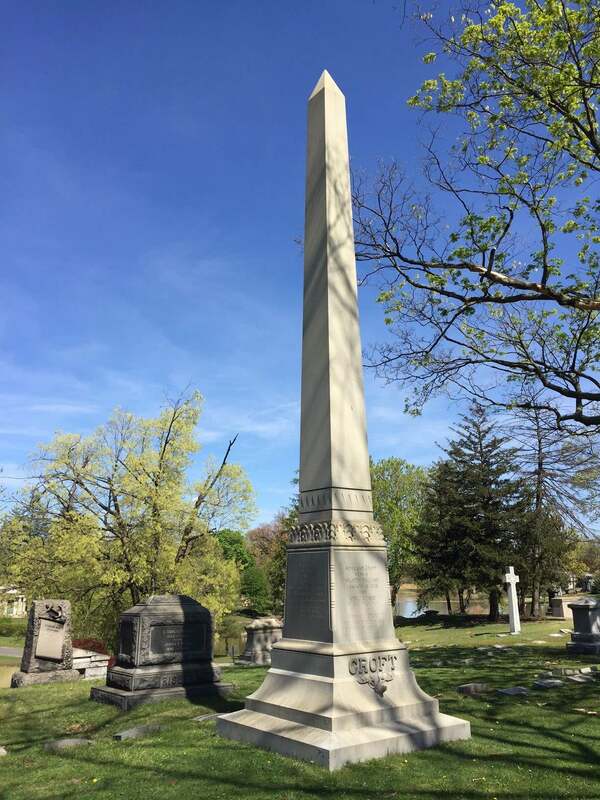 Letitia died on March 28, 1878 of scarlet fever and was buried in Mount Moriah Cemetery in Philadelphia PA.
Howland died on April 27, 1900 in Camden, New Jersey of diabetes and was buried April 30, 1900 at Harleigh Cemetery in Camden NJ. His wife, Mary Grainger Croft also died of diabetes on November 12, 1917 in Camden, Camden, New Jersey. She was buried next to her husband in the Harleigh Cemetery on 15 November 1917. His sons, John William Croft, George Howland, and Samuel Grainger Croft, carried on in the business, and a third generation was also involved.. Paintings by William M. Hoffman Jr. The Howland Croft mill remained opened in Camden NJ until the 1950s. 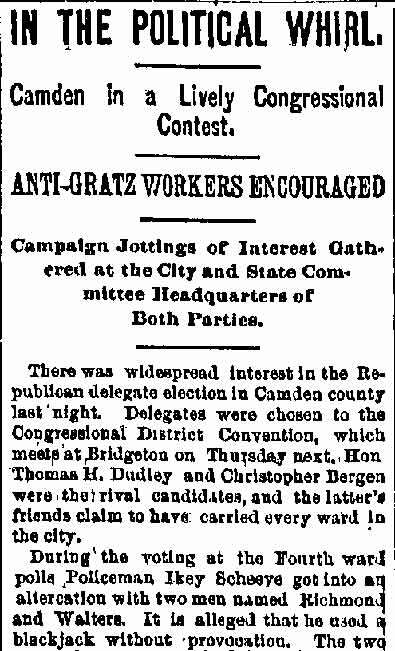 The concern employed many people from Camden, and drew heavily from the immediate neighborhood. 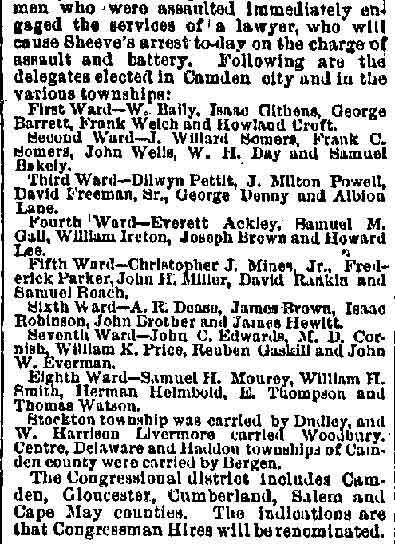 In 1928, the Howland Croft mill employed 313 people, according to the February 23rd Camden Anniversary edition of the Camden Courier-Post. 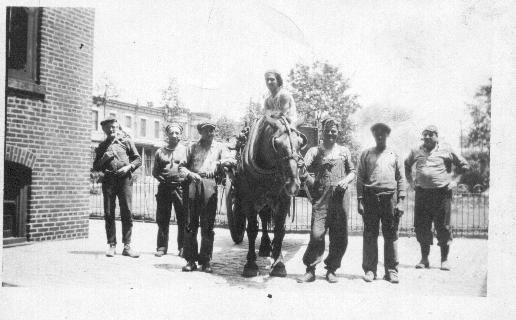 The two pictures below date from June of 1930 and depict the "Flue Gang", the men who worked in the boiler crew of the mill. The picture comes courtesy of Frank Breyer. 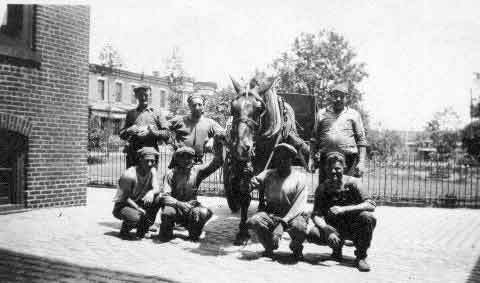 His father, George Breyer, is the man wearing overalls, to the right of the horse in the right-hand picture, and kneeling on the far right in the left-hand picture. 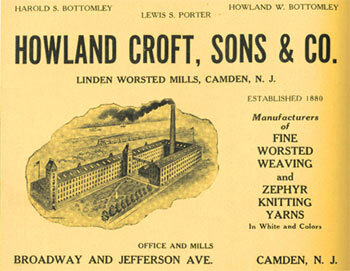 AMONG the worsted and woolen mills of Camden a conspicuous building is that belonging to Messrs. Howland Croft, Sons & Co., formerly Croft & Priestley, known as the Linden Worsted Mills, now located at Broadway and Jefferson avenue. The factory was established in 1880, under the present style, at the corner of Front and Linden streets, whence its name. It was a successful institution from the commencement, and remained at the old location until 1885, when the fine new building now occupied was erected on ground purchased for the purpose. The area of the ground occupied is 200 by 415 feet, and the buildings—all of brick and four stories in height—consist of three separate structures, each one being devote I to its own special department. They are: the mill proper, of the extent of 50 by 240 feet; the wool warehouse, of 100 by 40 feet, and the offices and storerooms, of the size of 80 by 30 feet. The force of hands is 400. The goods manufactured are worsted and woolen yarns in all the various grades and colors, and the brands of their goods enjoy a high reputation in the market. The members of the firm at first were Howland Croft and Herbert Priestley. In November, 1886, Mr. Priestley died, and thence until March i, 1889, the management devolved upon Mr. Croft. At the latter date the three sons of Mr. Croft, were joined with him in partnership, and the firm style became How-land Croft, Sons & Co. 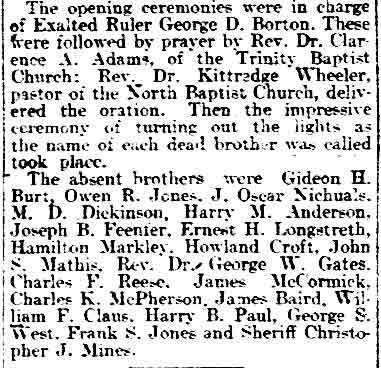 The names of the junior members are Mr. John William Croft, Mr. George Howland Croft and Mr. Samuel Granger Croft. The handsome engravings accompanying this too brief sketch of what is undoubtedly the leading commercial undertaking of South Camden, consist of a reproduction of the spacious buildings and of a portrait of Mr. Howland Croft. A journey through the numerous apartments of the mills shows that not only is the machinery and all appointments of the concern of the latest and most approved character that modern ingenuity and skill, backed by the most ample capital, could attain and operated by a colossal engine, whose mammoth proportions excite the wonder and amazement of all observers, and seems by its magnitude to rival the glories of the celebrated Corliss engine at the Centennial Exposition at Philadelphia; but its sanitary condition is carefully looked after, and a more contented and happier set of work-people is seldom seen in a large industrial enterprise. The story of Mr. Croft's life would be more readable than a romance, illustrating as it does the immense possibilities which the present age holds in trust for men of energy, pluck, perseverance and tried integrity, upon whom it heaps its richest rewards and crowns with its loftiest esteem. From the present summit of his well-won success, Mr. Croft cannot fail to contemplate, with feelings of the most entire satisfaction, the roadway over which he has journeyed and which is strewn with the conquests of laudable ambition over all difficulties. Personally one of the most genial and courteous of men, his simple and unostentatious habits of life have never been perverted by his great wealth and influence, and this fact tends to endear him to all with whom he is brought in contact, both in a business sense and socially. 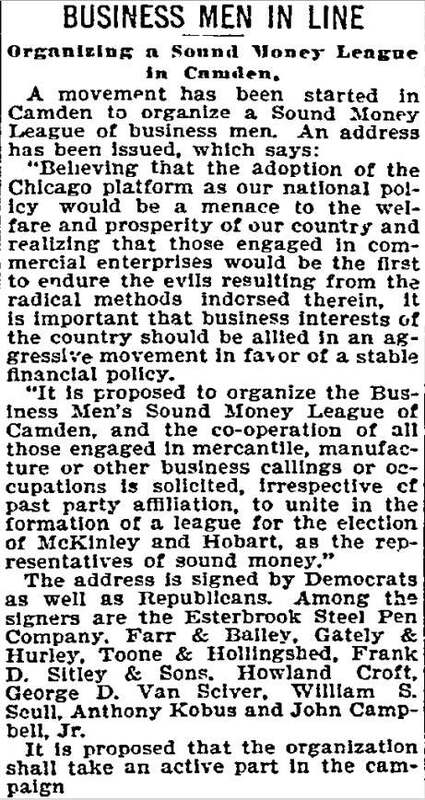 After earnest solicitation, he has consented to act as Vice-President of the Board of Trade of the City of Camden, and by his presence in that body will add to its dignity and the force of its membership, being a practical man whose executive ability has never been questioned, while his enthusiastic endorsement of every movement looking to the City of Camden's interest is widely appreciated. Harry B. Paul - George S. West - Frank S. Jones - Christopher J. Mines Jr. 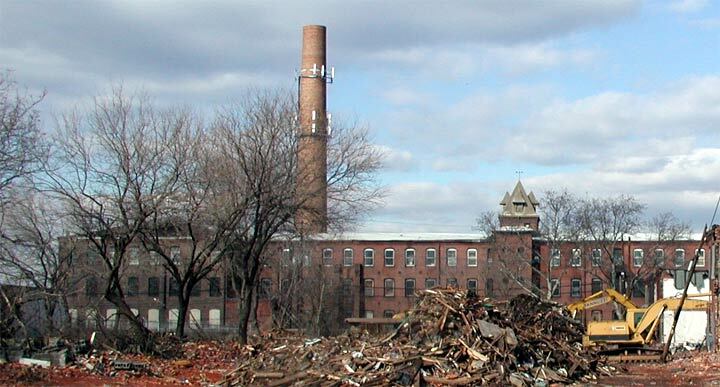 The demolition of Arlington Street, which lay between Chelton Avenue and Jefferson Street, adjacent to the mill, allows a view of the mill that has not been seen since the original construction of the houses on Arlington Street, over 100 years ago.